Searching through your bag for your keys is the last thing you want to do at the end of a long day. Carrying bags and kids while fishing around in the dark doesn’t help matters, either. The ladies at O-Venture feel your pain. They solved this annoying daily problem with the Big O Key Ring, a keychain bracelet for women. Clip keys or even a wallet onto the metal clasp, slip the sturdy silicone-coated bangle over your wrist, and your keys are on hand (but out of the way). You’ll be surprised at how handy this simple jewelry keychain is. After we wore one for a few weeks, we were hooked. And, because the Southern Founders know how to accessorize, the O-Venture Key Ring comes in bright, cheerful colors that will pop on your wrist and be easy to spot in your bag. @Rexanna We sO appreciate your cOmments. Our silicOne is fOod grade and nOn-tOxic. In addition, special features like our signature lOcking clasp add to the expense. Obviously, we could have made the prOduct less expensive, but we felt these features were impOrtant for our custOmers. Have a great day! @Rexanna At Grommet, we find that these "daily use" items are so very personal. You can easily get a functional key chain for free at many businesses and events. For many people that is the right price. It's just not that big a deal to them and if it functions, so be it. For others, the items we interact with daily (like toothbrushes, wallets, belts, shopping bags, cleaning products) are a place to be very intentional and solve for style, function or both. The pleasure such a purchase gives that kind of person is higher than for someone else. It actually has little to do with budget and more to do with value. That's what I see in the O Key Ring. I personally really resent the time it takes to find my keys in my bag and actually looked hard to find something like this before Grommet did. We further learned from the launch of the SOI light (an earlier Grommet) that the average woman spends 72 days of her life looking for things in her purse. I know I have lost that much to my keys alone! @Jules yeah i hear you but its way too expensive. It won't be in the price range for everyone, Jane. Be sure to check out our other great problem solvers here! Seems to me that the bulk of the bracelet would be rather annoying. I use a curly stretchy bracelet that stays in place on my wrist. I'd be worried that your bracelet would slip right off my wrist. I love your product but I have a xxs frame do you make slightly smaller Orings? Why does this cost sOOOOOO much? Hi Andrew, the cost reflects the high-quality materials and signature locking clasp O-Venture used in developing the product. You know for this price you are getting a product that will perform for a lOOOOng time. I think this is a really nice idea but I have to agree that it's definitely on the high price side - takes it out of the stocking stuffer class. also, the capital "O" can start to go from cute to annoying pretty quickly. I do wish you the best of luck with your product. @candice Thank you for checking us out! We appreciate it! I'm with everyone else on this--first, my keys would add incredible bulk to this. Second, it would slip right off my small wrist and hand. And third, if I want to hang keys around my wrist, I'll use a pretty, colorful, and much more affordable coiled stretchy band. Good luck, but....no. @Elizabeth Hi Elizabeth! You can slide the Big O to where it comfOrtably stays in place away from anything you are hOlding in your hands whether it's grOceries, your favOrite drink or a child. You will be amazed hOw it does nOt fall off your wrist. 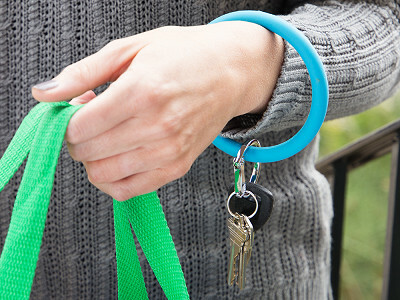 The gOod news about our key rings is that are durable unlike stretchy bands that break easily. @Janie & Caroline I gotta say I have had a leather one for a few years now and these are amazing . They truly make your life so much easier to have your keys on your wrist and without the buggy curly plastic thing . I have never ever had it slide off my wrist ? You don't hang your arm down when it's on your wrist - I always slide up past my elbow when I want it to stick on my arm ! I am going to buy a silicone one now - also for those people talking about price point - you kinda get what you pay for . This is very very nice quality and I would rather pay more for something that lasts and is functional . Thanks so much for the kind words, Caroline! It's great to hear a positive testimonial! Hi Kathleen, you have hit upon a challenge many Makers face when developing their products. There are limited manufacturing options that are affordable to them and when they go out and try to produce a high-quality product with a longer lifetime, they must raise the actual cost of the product. We tip our cap to O-Venture for not taking shortcuts in creating their key ring. If they had, we'd be hearing criticisms of an inferior product, which is the last thing you want as a Maker. @Mike What you just said hits on why the Grommet is so important and helpful for small businesses like us. The Grommet truly helps to level the playing field and gives small businesses a chance to succeed. We are so grateful for your work. @Janie & Caroline Thank you! We are delighted to introduce you to the vibrant Grommet community. Hi Joleen, Janie and Caroline can correct me if I'm wrong, but I don't think there is a limit (besides surface area and the strength of your wrist) to the amount of keys you can clip to the ring. heck, you can even clip a wallet on there. If you do have all of those keys, you would find it of especial practical use because you could have all of them right there at your fingertips. Well, close to your fingertips at least. @Mike You are so right. You wouldn't believe the number of keys and/or things people attach to their Big O Key Rings! This is where the strength and durability really cOme in handy! Hi Mary Frances, thanks for the kind words! One sure fire way they can reduce the price is receiving support here on The Grommet! And food-grade silicone is fantastic, kids or no kids! I have to agree with Mary Francis on all points. $28 is crazy for this key ring. Is ANYONE actually buying it?? Hi Mary Frances, Thanks! When you carry and touch something every day, nOn tOxic materials becOme much mOre impOrtant regardless of your age! Oh my gosh I love my leather Big O and soooo excited to see the new silicone ones ! I am ordering now !! I appreciate good quality. However, I definitely think you have to weigh the benefits with cost. To be honest my child chews on my keys not on the ring. I don't see that changing just because I attach food grade silicone to my keys. I think it would be a great product at a cheaper price point. Quite frankly I probably would forget to use it for what it is for. Just a recommendation. @Suzy We sO appreciate your recOmmendation! You can't imagine the number of custOmers who tell us this is a life changer...they never knew they needed it and now they can't live without it! We hOpe you'll give it a try! Wishing you luck with your product. Not for me, but had to comment on all of the Os in your responses. It's really difficult on the eyes and a little too much - please reconsider this as you mOve fOrward. @Janie & Caroline oooooops! Meant to put too much fun!!! I love this concept. These look much more versatile and durable than my stretchy band which I'm constantly replacing. The cost of one of these would be less than the multiple stretchy ones I've had to buy. The colors are so bright and fun I'll be able to easily find it in my bag. These will also make fantastic gifts for my friends. gOOd luck ladies! This looks like exactly what I need for when I decide to go walking on our Greenway, and don't want to wear a "fanny pack" or something to hold my car key, etc. Plus, I am forever laying my keys down in a store because for some reason, they never seem to find their way out of my hand, into my purse :) With this, I can slip it on my arm and go! @Vicki We lOve hearing this! We had these same issues ourselves...which was the inspiration behind the prOduct. enjOy! Just ordered a pink and a blue. Great idea. Can't wait to get them. Good luck!! Can you provide more detail about the clasp and how it locks? That's the thing I'm most interested in, because to me that's the element that makes or breaks the product's usefulness. As for the food-grade silicone, how "sticky" is it? I find that silicone can be quite the lint-catcher, and depending on the fabric of my sleeves or what's in my purse, it could get quite icky (though easily washable). Thank you for inquiring about our prOduct. We are happy to answer any questions you have. Regarding the clasp, rest your thumb on top of the O logo and push down to open, pull back until you hear the "click" to close. It is very simple and locks your keys, etc. onto the ring. We love that it won't break your nails like the normal spilt rings do. The silicone is not "sticky" at all. It's texture is very smooth and we have had no issues with it sticking to anything. Love the concept. I currently use a pony tail hair band for my keys when running or walking the dogs, and until the hair band is stretched out (but not too stretched it will break :- ) it can be tight on the wrist. So the concept of need for a specific functional "Big O Key Ring" is spot on! The price however, is out of range (for me) --- and I'm one of the ones who paid for $200 for the Aura Clean Sonic Toothbrush! Keep the ideas and products flowing! Best of luck!! @Janie & Caroline I have a key ring like the Big O Key Ring but its metal. Is there an advantage to using silicone over metal? I have had a metal "jailers" key ring for years. I don't know what I would do without it. The metal has gotten old and now discolors my wrist. I can't see spending this much money on a plastic ring. I would rather figure out some way of coating the metal one I have. If this item was less expensive I would probably buy several in different colors as I have told all of my friends about hands free key keeping for years. If you do discount this item, please let me know. We want to make sure to explain that this is actually a rust proof metal ring covered with silicOne for comfort and design. So you have all of the great function of your metal jailor key ring without the disadvantages of the discoloration and more. The silicOne will look and feel great lOng after you purchase it. We also added the signature locking clasp instead of the normal split ring so that you can easily add and remove keys, card case etc or hook your keys to a bag or belt loop. I just can't get past that exorbitant price! Even if it LOOKED a little more expensive...possibly. But the material does not enhance the function or appearance. I had a gold-toned ring like this that I loved, but it was only five dollars and did the job. Can't you lovely ladies find a more suitable material to make this keyring accessible to more of us who have less expendable incomes? @Robin HI Robin, We would love any suggestions on materials to use for Big O Key Rings! The price comes from the combination of details that make it function and last. The silicOne is actually a rust proof metal ring covered in nOn toxic food grade silicone. How stretchy is the bracelet? I have a big hand \ wrist and am worried it wont fit. I'm also measurement challenged. @Jonnetta I would guess that it's not stretchy at all since it has a metal core. But it might be offered in multiple sizes in the future. Amy, I couldn't have said it any better myself! I have to say you guys are amazing... you overcharge, advertise absurd items like this key thing... anyone can get a ring or bracelet and use it. The water bottles you advertised for $55 can be found for $44. Every day there's another overpriced and mostly useless product. Have you no shame for gouging? @sophia I don't understand why you visit this site if you feel so negative about their contribution to small business and entrepreneurs. Keep in keeping on Grommet! I am sorry, I would have to agree with most of the comments here in regards to the price. As someone that is familiar with starting a small business I know how expensive it can be. I do have a question....is your product made in the USA? I looked at your product and thought it was a wonderful idea until I scrolled down and saw the price. Sorry, just being honest. I could see spending $10-$15 for it, to see if I would like it and if not, no big deal, but almost $30.00? Too much for me! Anyway, I would like to know if it's made in the USA. @Katharine Wow I am so surprised at all this chatter about the price. I think it is clever and well thought out and made to last. There are not many cool useful products on the market that sell for less. I am buying one for sure. You go girls! Marlowe, thank you, thank you, thank you! EnjOy! The idea is sound & as others have said, pricey but I wish it wasn't made in China. I would be much more inclined to pay a higher price for American made. Best of luck to you both. Nothing like American ingenuity! Tammy, I'm sure Janie and Caroline would be right there with you. Unfortunately, it is often very difficult to find affordable manufacturing opportunities in the US. With enough support on The Grommet, they can work their way towards that. You can learn more about what you can do to bring back American manufacturing here and you can browse our Made in the USA collection here. Searching through your bag for your keys is the last thing you want to do at the end of a long day. Carrying bags and kids while fishing around in the dark doesn’t help matters, either. The ladies at O-Venture feel your pain. They solved this annoying daily problem with the Big O Key Ring, a keychain bracelet for women. 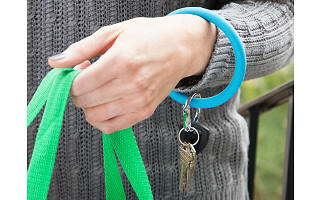 Clip keys or even a wallet onto the metal clasp, slip the sturdy silicone-coated bangle over your wrist, and your keys are on hand (but out of the way). You’ll be surprised at how handy this simple jewelry keychain is. After we wore one for a few weeks, we were hooked.